Ornate Horned Frogs, more commonly known by their nickname of Pacman Frog due to their tendency to eat anything that can fit into their mouths, grow to about 6" in length and spend most of their time in the same spot waiting for food to come their way so if you are looking for an active and lively pet this frog is not for you! Pacman Frogs are not colony frogs like many of the dart frogs and need to be housed individually as their appetites can lead them to eat any other smaller frog in their enclosure so if you are planning on getting a Pacman Frog do not worry about getting him/her a friend. Similar to most other amphibians, Pacman Frogs are a more "look than touch" sort of pet as they are prone to bite and their skin can absorb oils and chemicals from our hands which could be toxic for them. Handling should be restricted to times when necessary such as for full enclosure cleanings. Despite not being a "cuddly" pet, Pacman Frogs can still be entertaining and rewarding to raise. An in-depth and well-written care sheet submitted to the Frog Forum by Stanton Waits. This is a must read if you are thinking about getting, or already own, a pacman frog. 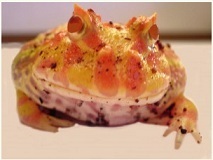 A great overview on pacman frog care that can help someone decide if this frog will be a good fit for them. This care sheet is written by Jabberwork Reptiles which carry pacman frogs so they have personal experience caring for these animals.